Better late than never. The Hudson Reporter did a twofer on the recent payroll discrepancies out of Mayor Ravi Bhalla's office and highlighted the political attacks against council members. Those attacks as it turned out, came from first-ever appearances before the council last year by acknowledged friends of Bhalla's Chief of Staff John Allen. The reactions and the political operations run out of the mayor's office are more than a little troubling. did and used another friend like cannon fodder. 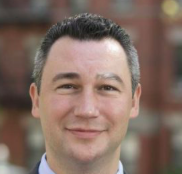 The two Hoboken political novices were coordinated and directed by John Allen who, while caught in flagrante delicto in these political operations received the biggest raise, over 7%, in all of City Hall. The council is less than amused with Bhalla's political face punchers and their repeated operations against its members at council meetings. The term face punchers was coined and assigned to the political operatives in the Hoboken mayor's office by the Hudson County View. Last summer, one friend was seen having dinner with Ravi Bhalla and John Allen and the other dropped his payload at the City Council meeting before delivering himself immediately after to the front door of John Allen. Busted! Ravi Bhalla's Chief Face Puncher in the mayor' office, John Allen. but he got a big raise anyway and now makes almost as much as the mayor. Councilman Mike DeFusco defiantly struck back in a public release. Councilwoman Tiffanie Fisher, a high priority target to see silenced by Ravi Bhalla and his face punchers for her troublesome policy wonk skills asking questions also punctured the political operation against her where race-baiting was seen from the public microphone. We're talking Ravi Terror Flyer level ugly here. 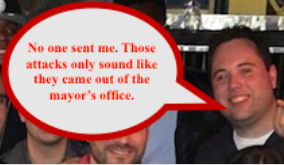 "Repeatedly since June, certain members of the Hoboken City Council who did not support Mayor Bhalla in last year's election have been subjected to personal attacks... and "each have been identified as having ties to John Allen, Chief of Staff to Mayor Ravi Bhalla." The howling commenced almost immediately with the usual proclamations of victimization and banshee level lying screeds at Sybil's Cave, where the mayor's political attacks are closely coordinated. Vijay Chaudhuri, the former (or is it current) campaign manager for Ravi Bhalla walked back previous admissions against interest where John Allen acknowledged his friends. Now they're called people John Allen "knows... just like he knows many other residents involved in Hoboken civic life." In the famous words of former Business Administrator Arch Liston, "Oh, I believe that." Talking Ed Note: Look who's calling someone else crazy. How sick do you have to be to write that under the thinly veiled "cloak" of "anonymous" in service to Ravi Bhalla? Grafix Avenger is the home of crazy.